From the introduction by Joseph Salerno: "Rothbard employs the Misesian approach to economic history consistently and dazzlingly throughout the volume to unravel the causes and consequences of events and institutions ranging over the course of U.S. monetary history, from the colonial times through the New Deal era. One of the important benefits of Rothbard's unique approach is that it naturally leads to an account of the development of the U.S. monetary system in terms of a compelling narrative linking human motives and plans that often-times are hidden and devious, leading to outcomes that sometimes are tragic. One will learn much more about monetary history from reading this exciting story than from poring over reams of statistical analysis."
.) Everybody has thought about getting quick payday loans at one time or another. Currently, the normal avenue for quick payday loans is an actual payday loan store. However, credit unions and traditional banks are trying to get in on the game of short-term loans and instant payday loans. Their market share on short-term credit has been somewhat compromised because of the emergence of the payday lending industry. Some credit unions say that their instant payday loans have lower interest than payday loan shops, but it isn't the truth – all you have to do is do a little shopping around and research. If you need some temporary debt relief, then find the quick payday loans that suit you best. I. 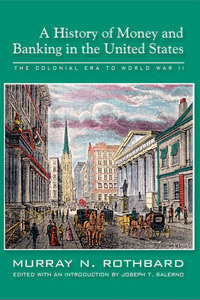 "The History of Money and Banking Before the Twentieth Century." This was Rothbard's contribution to the minority report of the US Gold Commission and treats the evolution of the US monetary system from its colonial beginnings. II. "Origins of the Federal Reserve." This thrilling paper lay unpublished for a long time and only recently appeared in the Quarterly Journal of Austrian Economics. It is easily the most comprehensive account in print. It names names and shows the constellation of interest-group affiliations that led to its creation. III. "From Hoover to Roosevelt: The Federal Reserve and the Financial Elites." This previously unpublished paper goes into great detail on how the Morgan and Rockefeller financial interests shaped the political and behavior of the Fed. IV. "The Gold-Exchange Standard in the Interwar Years." This large section has appeared in print but not in its full version. Rothbard elucidates the reasons why the British and US government in the 1920s re-created the gold standard in a manner that was profoundly flawed and potentially inflationary (leading to the Great Depression). V. "The New Deal and the International Monetary System" This section appeared in a volume first published in 1976 and which is now very difficult to find. Rothbard argues that an abrupt shift occurred in monetary policy just before the US entered World War. He shows who benefited from the shift from dollar nationalism to dollar imperialism. He concludes with a smashing attack and expose of the Bretton Woods agreement of 1944.